Wildlife veterinarians are qualified to treat a variety of species including reptiles, birds, and mammals. Becoming a licensed wildlife veterinarian requires a significant educational commitment, but the average salary for veterinarians is around $90,000. Board certified practitioners earn higher salaries. Zookeepers are responsible for the daily care of a zoo’s animal collection. Regular duties include feeding, giving medications, cleaning enclosures, and reporting behavioral changes. Most zookeepers have at least a two-year degree, and salary generally ranges from $23,000 to $45,000. Marine mammal trainers condition marine species to perform specific behaviors on command. They are also responsible for supervising daily care and providing behavioral enrichment activities. Most marine mammal trainers have at least a two-year degree, and salary ranges from $30,000 to $40,000. Herpetologists are biologists who study reptiles and amphibians. They may be involved in a variety of areas including research, education, or collection management. Herpetologists must have a four-year degree at minimum, and graduate level degrees are preferred. The average yearly salary is about $40,000, though educators and top researchers may earn double that amount. Wildlife biologists study a variety of wildlife species and may be involved in research, education, or managing local wildlife. Wildlife biologists must have at least a four-year degree, and most positions give preference to those with graduate degrees. The average salary for wildlife biologists in 2017 was around $60,000. Ichthyologists are biologists who study fish, sharks, and rays. They may be involved in a variety of duties depending on their role in research, education, or collection management. A four-year degree is required, with most ichthyologists holding graduate level degrees. The salary for this position averages close to $60,000. Zoo curators oversee the acquisition and management of animals in a zoo’s collection. They are also involved in the management and hiring of staff members. Curators usually have a four-year degree, with an advanced degree preferred. Salary averages about $55,000 per year. Aquarists care for marine mammals and fish kept at aquariums. Aquarists are responsible for general care, habitat maintenance, feeding, and assisting with veterinary procedures. They must have a four-year degree and scuba diving certification to enter the field, and they can expect to earn a salary in the $20,000 to $35,000 range. Entomologists are biologists who study insects. They are usually involved in research, education, or a combination of both. Entomologists must have a four-year degree, and teaching and research roles often require advanced degrees. The salary for entomologists is usually in the $55,000 to $65,000 range. Zoo educators teach visitors about the zoo’s collection of animals in an effort to promote conservation. They may be involved in giving tours, presenting formal seminars, and circulating throughout the park to answer questions. Most zoo educators have at least a four-year degree, and they can expect to earn a salary in the $30,000 to $40,000 range. Primatologists are biologists that study primates such as gorillas, orangutans, and chimpanzees. They are most frequently involved in research, education, or conservation. Primatologists must have at least a four-year degree, and graduate level degrees are preferable. The average salary for this position is about $55,000. Fish and game wardens enforce laws and regulations relating to wildlife in a designated area. They may be involved with issuing hunting licenses, conducting surveys of local game, and assisting injured wildlife. Two to four years of education in wildlife management or law enforcement are desirable. The annual mean wage for this position is roughly $55,000. Zoologists are biologists who study a variety of wildlife species. They may work in education, research, or collection management. This position requires a four-year degree, and jobs requiring applicants have graduate degrees in the field are most common. The salary for this position usually ranges from $55,000 to $85,000. Marine biologists study a wide variety of aquatic animals. They may work in research, private industry, or education. A four-year degree is required, and most marine biologists have an M.S. or Ph.D. Salaries range from about $50,000 to $100,000. Beekeepers (apiarists) manage bee colonies that produce honey or other products like beeswax. Beekeepers divide colonies, replace combs, and construct new hives. 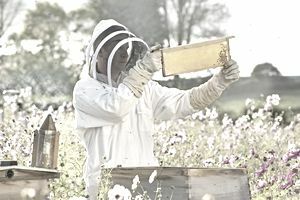 No degree is required to enter this profession though many beekeepers do hold degrees. A full-time beekeeper can make up to nearly $100,000 per year; part-time keepers can expect to make about $20,000. What Does It Take to Be a Wildlife Manager?